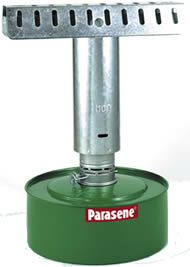 Europe's favourite paraffin heater up-graded. Ideal for use in a small greenhouse of up to 4 sq. ms (6' x 6'), or as an antifrost heater in a larger structure. Europe's favourite heater up-graded. Ideal for use in a small greenhouse of up to 4 sq. ms (6' x 6'), or as an antifrost heater in a larger structure. Quality build for years of use!